William performed on Show 310, recorded in Aspen, CO, on July 12, 2015, at age 18. 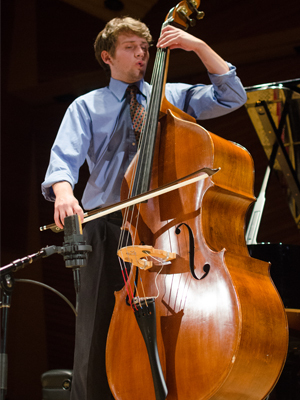 William Langlie-Miletich, double bass, 18, comes from the rainy city of Seattle, Washington. He has been playing the double bass for five years, and has appeared in some of the nation’s most prestigious youth ensembles, including the Boston University Tanglewood Institute Young Artist’s Orchestra, as well as The National Youth Orchestra, where he performed in their inaugural tour to Russia under the direction of Valery Gergiev with soloist Josh Bell. He currently is a part of the Seattle Youth Symphony Orchestra, as well as the Seattle Collaborative Orchestra, and studies with Jordan Anderson, Principal Bassist with the Seattle Symphony. Outside of music, William enjoys basketball and film study.